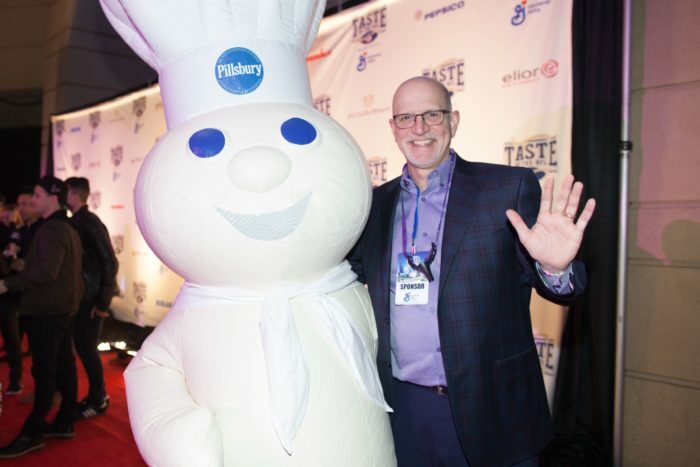 The Pillsbury Doughboy with General Mills Chairman and CEO Jeff Harmening, at the 2018 Taste of the NFL in St. Paul, Minnesota. General Mills teamed up with Taste of the NFL on Saturday night to raise awareness and money to kick hunger during the busy “Big Game” weekend. We were the event’s presenting sponsor. The annual gathering is a super-sized fundraiser that brings together restaurant chefs and former professional football players representing the 32 cities with pro football teams in the U.S., for a night designed to raise money for designated Feeding America affiliated food banks in those cities, as well as other select hunger relief organizations. Taste of the NFL, called a “Party with a Purpose,” started in Minnesota in 1992 and returned this year for its 27th event, for a sold-out crowd at the St. Paul River Centre. About 15 percent of the proceeds from this year’s party will directly benefit hunger relief efforts in Minnesota. Even our very own Pillsbury Doughboy made it out for the big night. Taste of the NFL has raised more than $25 million to fight hunger since it started. Wayne Kostroski, founder of Taste of the NFL, talks about having the impactful event back in Minnesota, in this video. We devoted this month’s episode of our podcast to Taste of the NFL. The show features several interviews, from the event, as you see in the description below. The premiere party in the state that hosts “The Big Game” each year is Taste of the NFL, which donates a portion of its proceeds to food banks and hunger relief organizations in each of the 32 pro football cities. It started in 1992 when Minneapolis was home to the game for the first time. This year, Taste of the NFL was back in Minnesota for its 27th event. In this episode, you’ll hear from the founder of Taste of the NFL, Wayne Kostroski, Andrew Zimmern (“Bizarre Foods”), Second Harvest Heartland’s Rob Zeaske and General Mills Chairman and CEO Jeff Harmening. For more information, visit us at blog.generalmills.com.